If you haven't seen this yet, this is awesome! Of all the years I've seen Klehm's Song Sparrow host a fall sale, they usually just select 5-10 specific peony varieties to put on sale (usually all herbaceous) or have a buy 2 get one free sale (herbaceous only). I don't think I've ever seen them put their Intersectional/Itoh peonies on sale, and to be able to just buy 1 or as many as you want and still get a discount - WOW! that's an awesome deal!! 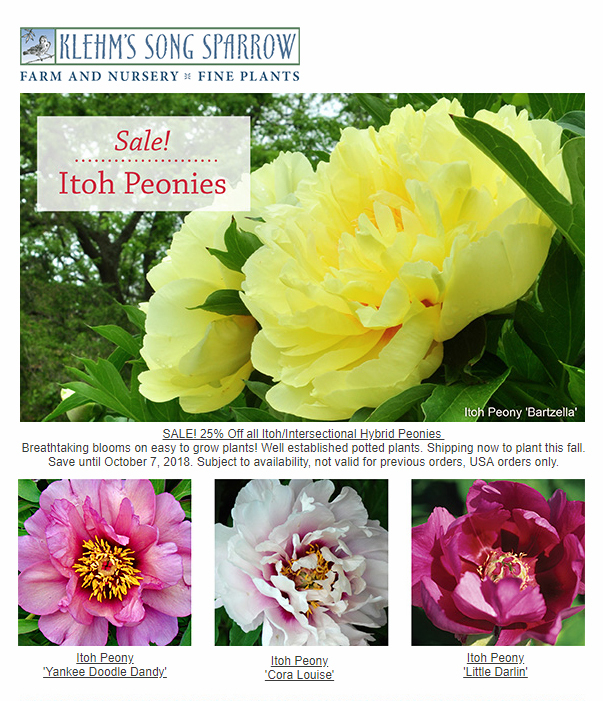 If you've been on the fence about whether to buy one of their gorgeous Itoh peonies, especially some of their just released new Intersectional offerings, 2018 Peony 'Pink Double Dandy' aka 'Keiko' for Sale at Song Sparrow (both of which are on sale! ), then now's the time to take advantage of this great sale! If you are thinking that Klehm's prices are higher for intersectional peonies than other vendors, 2018 Intersectional Peony Catalog Price Comparison List, well, they usually are. But here's a secret you may not know, Klehm's Song Sparrow grows all of their Intersectional (and Tree) peonies in pots. So you are actually purchasing a growing potted plant. This plant has a big advantage over any other intersectional peony you might buy from another vendor. It's like gaining an additional year (or two) of time for your Intersectional peony plant to increase in size, and the plants are usually larger than what you would get from planting just the root. Plus Intersectional/Itoh peonies grow great in the South. Intersectional peonies are such robust plants from their tree peony and herbaceous peony heritage - it's like the best of both worlds. I haven't grown one yet that wouldn't grow here! !